Save time recording bills, scanning contracts, approving documents, and become a paperless company. Move to a paperless approach. Take advantage of a fully integrated approval, control and validation process, with activities, chatter and action rules to make sure everything gets done by the right person at the right moment. Using the email gateway, bills are created automatically, from a scanned document or from your vendors email directly. Assign documents to your colleagues, customers or vendors. Share files and public folders with your clients, and let them import documents directly. Don’t waste time printing and scanning documents that someone has to sign, assign them to the right person, get them signed and send them back directly. Work in batch by requesting approvals, changing folders, tagging and assigning multiple files at once instead of one by one. 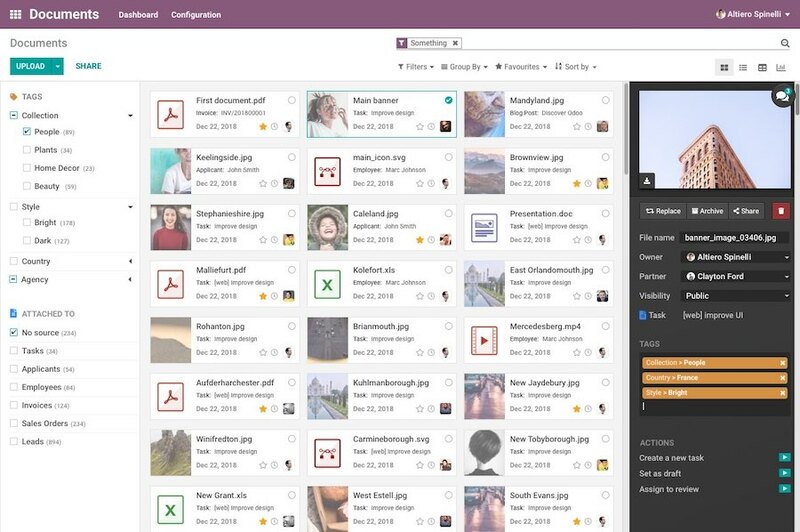 Documents is integrated with other Odoo Apps, track versions of plans and worksheets with PLM, create your vendor bills in one click with the help of our AI in Accounting or create tasks from specific documents. How many documents (contracts/NDA) are signed? How many times people have to search for a document? How many times people have to request a document? How many bills are recorded? How many people are hired? With Documents, everything is where you need it, instantly available. Keep track of all your files and never lose one, all of them are organized and stored in the same place, safe and secure.